Last week, the London Rebels and Birmingham Lions booked their tickets to the big show in Doncaster (yes, that sounds weird to us too) on September 26. 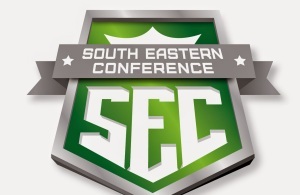 Check out our playoff preview here. Who’s joining them from the North? We look at the contenders taking the field at Woodham tomorrow. Here’s how it stands in the quarter finals. 2013’s runners-up have a chance to get some revenge against the team that beat them in that final two years ago. With the London Rebels sweeping through to the last four, the Warriors could well be preparing for Part Two of that duel soon. 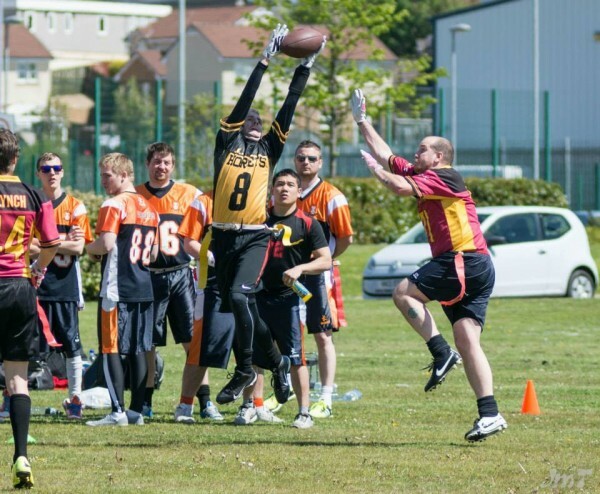 First, they’ve got to get past the Edinburgh Outlaws, a team who worked hard over the offseason to claim their place in the knockouts. At times, it didn’t look like Woodham were trying very hard at all, sweeping many of their new division rivals in the MEC North aside at jogging pace. Don’t let that fool you though. The Warriors are where they are because they’re a very smart side, drawing on the experience of players like Adam Spanswick, the arm of Elliott Holt and the speed of Kiaran Dixon to carve teams up. The team has grown up together from the youth ranks, but this season they addressed their notoriously small squad by adding some fresh blood to the roster. Are they better than last year? It’s hard to say, but they’ll be keen to avoid falling at this stage of the competition again. When Glasgow added former Carluke QB Alan Young in the offseason, they squeezed another cool toy into an already crowded box of wonder. The Hornets blend speed with football smarts, boasting young talent such as Nicky Farrell, established trophy-winners such as Grant Mclennan, and intelligent players like Callum Bell and Andrew Gibson. In retrospect, it’s no surprise that the Hornets rallied from narrowly missing out on the playoffs in 2014, and they’ve put a few ghosts to rest with a 2015 performance that has put them firmly among the favourites to qualify. This season, they scorched quite a few less experienced teams for big wins, and caused a few of the more gristled ones to slip up too. Although a late loss to Aberdeen spoiled their unbeaten season, they’ll definitely be ones to watch in the knockouts. If you can believe this, the Sheffield Predators feel almost like an under-the-radar team this season. That sounds frankly ridiculous, since last year’s finalists only lost one game all season, and look as deadly and driven as before. That’s mostly down to the number of teams who were chasing unbeaten seasons in the late stages of the schedule. 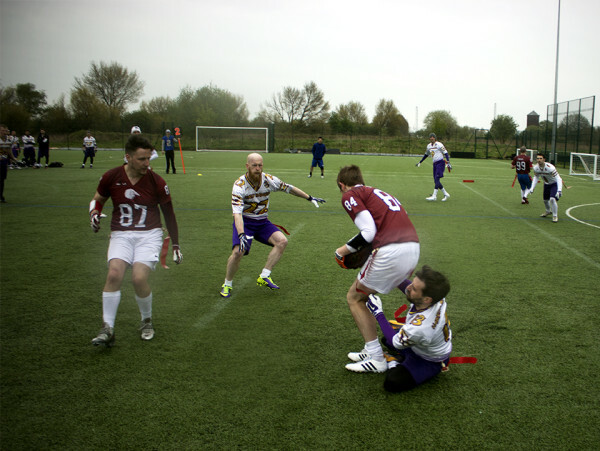 But if you think that means that we’re overlooking the Preds for this year’s BritBowl, think again. While they lost rock-solid QB Matt Lollar in the off-season, Dean Whittingslow has coolly stepped into the role. Of course, it does leave them down one weapon at receiver, but players such as RB Josh Allen and glue-handed WR Tim Darracott are more than enough to give defenders nightmares. The secret of Sheffield’s success is that they’re very well-drilled, and tend not to make too many mistakes. There were very few drops on their way to the final last year, and they’ll be hoping to lay down a similarly-efficient foundation again, paving the way from those “wow” moments that we know players like Darracott can conjure up. Grangemouth would have been pleased to escape the HNC North just as it started going score-crazy, but that doesn’t mean they’re not able to hold their own. If anything, last year’s exit at the hands of the Aberdeen Oilcats was a tiny surprise, since the Broncos had dispatched them twice already that season. Grangemouth have the worst record of the division winners this year, but will be hoping they’ve saved their best performance for the playoffs this year, rather than the one they managed in 2014. When the Broncos won the HNC North last year, players like Kenny Mackay were quick-stepping matchup nightmares. This year, with Kenny partly distracted by kitted duty with the Edinburgh Wolves, Kevin Woods has been the scoring threat, grabbing the points that Grangemouth needed to get through some potentially tough games. In Fraser Thomson, they’ve got a wise head capable of reading a game and coming up with crucial plays. And the ever-growing Broncos squad has mixed veterans such as QB John Myles with promising young players such as Matthew Ross. Right at the end of the season – when HNC North challengers were scoring more than 80 points a game and nobody was looking too surprised (eh?) – the Oilcats were actually challenging for the division lead. In the end, Glasgow probably deserved the crown on balance, but it’s the nature of the Oilcats to be under-rated by many. Did you know they’ve been at BritBowl for six straight years now? Not bad for a team that has to make a commute to games that would make Frodo Baggins squeamish. Ask a more southern flag player about the Oilcats, and the first thing they’ll mention is Gary Elliott. But that’s mainly because they can see him from Reading (and possibly from space). What doesn’t get mentioned as much is that Scott Stopani is maturing into a decent quarterback. Or that Scott Forbes still reads the play very well on defense. Or that Mike Scott has worked his way into the GB squad with persistence and dedication. Or that Robin Johnson has the ability to make people miss at running back. Their matchup with the Predators tomorrow should be an interesting one. Edinburgh had a quiet year in 2014, and lost their established quarterback Steve Russam in the offseason. However, they put in the work in their time off, and it showed in 2015. Announcing their intentions with a shutdown 15-0 victory over the Newcastle Blackhawks on their opening day, they continued their run by combining stingy defense with an ability to sustain drives and remain calm on offense. Undoubtedly, one of Edinburgh’s stars of the year was their blitzer. Ben Reiss made the position his own in 2015, outshining pretty much everyone else in the north at the position and forcing quarterbacks to tear around the field like their hair was on fire. Ewan Miller has kept plays alive at quarterback, and when he needs an outlet, Liam Clutterbuck has a way of getting open. Or, he could just hand it off to the aggressive runner Jordan Hepburn. On defense, David Hogg has been a key part of a defense that’s tightened the screw on more than one team this year. The only concern is that when Edinburgh struggle, they struggle big-time – as seen by the results against the Glasgow Hornets and Aberdeen Oilcats. Woodham will be a daunting test. Like a parallel-dimension Donovan McNabb, the Mansfield Honey Badgers found out the truth about overtime this year. In the flag world, it doesn’t happen. So if you ever get the pub quiz question that sounds like: “Who scored a winning touchdown against the Manchester Crows that didn’t win them the game?”, you can look smart in front of all your friends and win the giant tub of Quality Street. While the Honey Badgers once again fell into step behind the Sheffield Predators in the MEC South this year, they remain a potential banana skin. Simon Denning and Joe Hainey offer options at quarterback, while Dave Hine leads the defense. 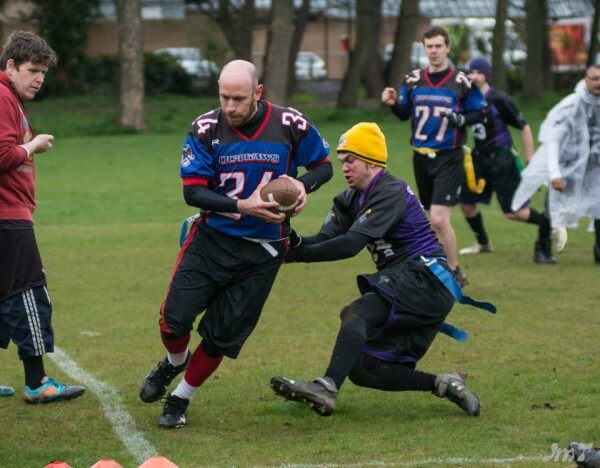 They’re a team that loves the deep score, and they look recovered from a shaky start to the season that saw them fall to the Manchester Titans. 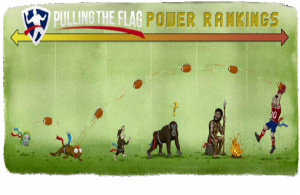 In the final gameweek of the regular season, they took the Woodham Warriors to the wire, and were narrowly close to returning a pick six for an upset win. Can they surprise a few folks here? Nice teams should win prizes. 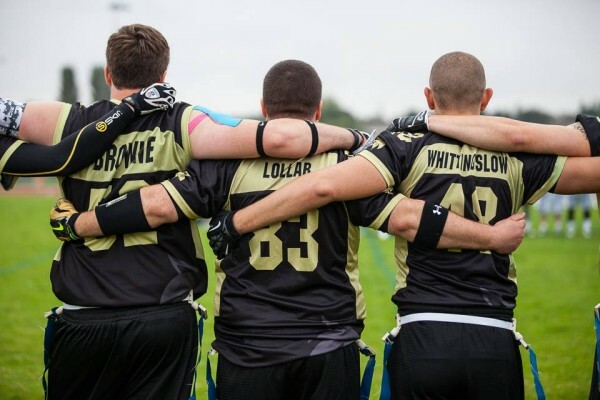 But life isn’t fair, and the friendly folks from the Vipers got firmly shoved into flag football’s “friend-zone” last year with a 39-12 playoff quarter final stomping at the hands of the Aberdeen Oilcats. Even with Woodham joining their division this year, the Vipers looked pretty safe to qualify this season, as they’re a balanced side with a decent handle on the game. Another year has added a little more swagger to the Vipers (although they’re still the team you’d be most comfortable introducing to your mum). James Cooper has had some pretty good targets this year. Mike Sullivan continues to thrive, while Ingrid Thaïs Neveu is a dangerous blitzer. The rookies are coming along nicely for the Vipers too. Rob Poole hauled in 13 touchdowns in four tournaments, while Dan Williamson’s haul of 10 isn’t bad for someone who only started playing the sport in April. Ed Dyson got 6 in one tournament alone. On defense, Opposition players have described Rudi Halfmann’s tackling as “automatic”, making him a difficult person to play against. However, it looks like they won’t be able to bring a full squad to the tournament this year, so they’ll have to play above themselves to take down the rolling Glasgow Hornets. Will they be one-and-done again this year, or will they be able to turn some heads? Editor’s note: To be honest, we’ve been a bit blindsided by recent clarification of the second round rules, which was made after we submitted our picks. So forgive us if any of these predictions are impossible (ahem). Daniel McGill is predicting that Woodham, Glasgow and Grangemouth progress to the semis. He’s torn on the last result, but after a bit of prodding he’s going for the Sheffield Predators. From there, he thinks it’s going to be Woodham and Glasgow. Neil Wymer backs Woodham, Aberdeen, Glasgow, and Grangemouth to go through. In the semis, he likes Aberdeen and Glasgow. “Mr Bulletin-Board-Material” himself – Mik Smith – is taking Woodham, Glasgow, Aberdeen and Grangemouth. From there, he’s backing Woodham and Glasgow. “I’ve got a very very difficult pick to make here. First, the easier selection: Woodham. They have steam rolled their way through the league this year, which is great to see considering there were rumours in the offseason that they were due to be extinct. The Warriors have bounced back and dismantled pretty much everyone en route to a perfect record, and I see them qualifying for Britbowl with relative ease (with no disrespect to any other teams they may face).